Seniors’ Services has been supporting 1st year Medical Student Placements from the University of Toronto (U of T) for many years now, and through the advocacy of two of our previous Placement Students, our Organization was invited to participate in this year’s Medical Program’s annual ‘Integrated Clinical Skills Course’ event at various Hospitals across the GTA! Our Placement Students felt that it was important that all Medical Students, at some point in their training, have the opportunity to engage with a patient who is Deaf. 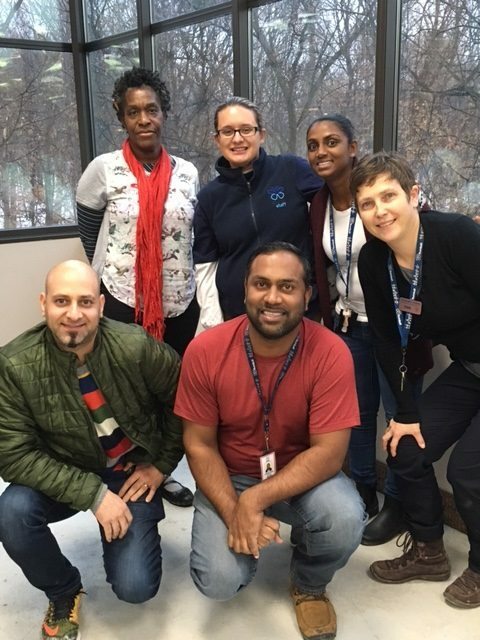 On the morning of January 12th, having completed the required 4 hours of comprehensive ‘Standardized Patient Training’, five of our Deaf Staff participated as “Simulators” at separate Hospitals across Toronto. Each presented themselves as a patient with very specific symptoms and histories, giving the Medical Students the opportunity to interview and support their Deaf “patient”, through Interpreters, in a supportive learning environment. Initial feedback from our Staff and the Medical Students, was that this was an important and meaningful educational interaction. BRCCED looks forward to continuing its support of the U of T Medical Program, and hopes to build on its capacity to support it. Sincere thanks to Dr. Wong, Director of the ‘Integrated Clinical Skills Course’, our ‘Standardized Patient Trainer’, Lorena Dobbie, our Interpreters, and our Staff for helping to make the morning such a success! Mehdi Safavi, Carol Raymond-Jackson, Lisa Faria, Suma Kanagasekarampillai, Ewa Swiecicki and Pradeep Peter- thank you so much!